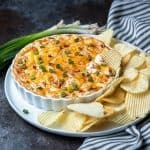 Stir together cream cheese, sour cream, bacon, cheddar cheese, green onions, ranch dressing, garlic powder and pepper in a large bowl until combined. Spoon into an oven-safe dish and spread evenly. Sprinkle with reserved cheddar cheese. Bake for 30 minutes, or until hot and bubbling around edges. Remove from oven and sprinkle with paprika and reserved sliced green onions. Serve warm.